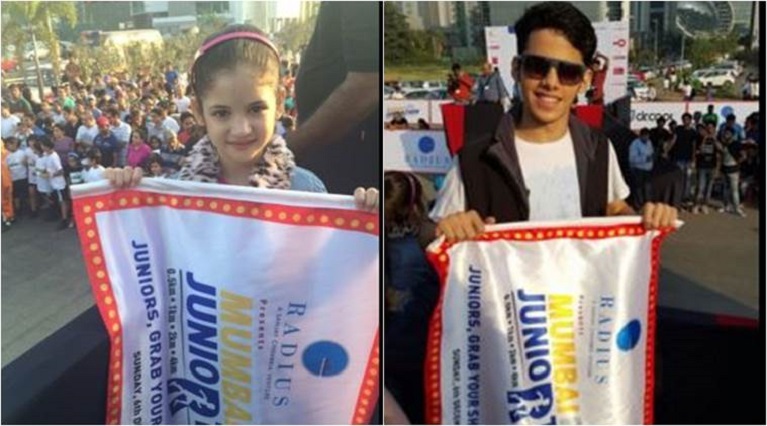 Young actors Harshaali Malhotra, Darsheel Safary and Avneet Kaur added fun and spark to the Mumbai Juniorthon at Bandra-Kurla Complex here on Sunday. "It's a Sunday morning so everyone's supposed to be very lazy, sleepy and on their phones. All the kids came along with their parents, spent some quality time, made some memories. It's really cool because you're running, it keeps you healthy and fit," Darsheel said. "I am having a blast and I'm sure everyone is also having a blast. All are just excited to run, no one's even ready to wait for the flag. The spirit of it is what matters the most," the "Taare Zameen Par" actor added. Numerous children in the age group of 6-15 years participated in various races at the event. And for them, more than the fun, the competitive spirit to win the race was evident. "It's a beautiful day and I'm glad to be part of this event. Thanks to Mumbai Juniorthon for inviting me to be part of the event. It's a beautiful concept and I thank Party Sharty for coming up with this event," said "Jhalak Dikhhla Jaa 5" star Avneet. The event was held to encourage children to abandon their addiction to gadgets and to embrace running and other physical activities. "Bajrangi Bhaijaan" fame girl Harshaali, who flagged off the event, said: "The kids said bye-bye to their iPads, computers and phones and put on their running shoes. I have always seen marathon for adults and this is the first time I saw it for kids." The event has been organised by Party Sharty and presented by Radius Group. Much Ado on the Hairdo! Kartik Aaryan's hairstyle are literally goals!